Like many baby boomers who grew up in and around the Michigan cities of Ypsilanti and Ann Arbor, W. Jeffrey Koepp had long heard tales from older family members who'd worked at the nearby Willow Run Bomber Plant of how the B-24 bombers built there turned the tide of World War II against Germany. As vice president of operations of A.F. Smith Electric, an Ypsilanti signatory contractor since 1920, and as a member of Ann Arbor Local 252, Koepp leapt at the chance to preserve that particular piece of his community's history when the building needed saving. He's doing so with the help of other IBEW brothers and sisters and the National Electrical Contractors Association's Southeastern Michigan chapter. 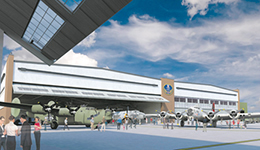 All are volunteering their time and donating money to develop a new Yankee Air Museum on the site of the long-shuttered factory. "They've stepped right up," said Koepp, a journeyman inside wireman whose family now owns A.F. Smith. "Any time I've asked for help, everyone has asked, 'What can we do? What would you like from us?' Suppliers have donated cable and lamps for temporary lighting. It's been a group effort from the whole community." Koepp's grandmother and grandfather worked at Willow Run, which was built by the Ford Motor Co. and opened in the summer of 1942. Henry Ford had retired as the company's chairman, but still had a major say in its direction. He insisted it refuse public funding for the plant and instead build it itself and sell it to the federal government. The company then leased it back for the rest of the war. The massive facility — it had about 3.5 million square feet of factory space — was built without pillars in many sections so it could house an assembly line more than 1 mile long and wide enough to allow planes to roll off it. Designed by architect Albert Kahn, it was believed to be the largest factory in the world under one roof at the time. By 1944, workers were rolling out one B-24 every 55 minutes, 24 hours a day, seven days per week. Some historians believe the term Rosie the Riveter, used to honor the women who stepped up to handle the traditionally male factory jobs during World War II, originated at Willow Run in honor of Rose Will Monroe, a worker inside the plant. "Without the Willow Run bomber plant, we would not have won the war," said Dennis Norton, the Yankee Air Museum's co-founder, whose mother worked at Willow Run. "We had to destroy Germany's industrial might in Europe before sending troops in there, and that's what the B-24 did."